Trail ready at 3 lbs. 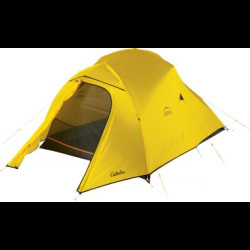 12 oz., Cabela's XPG Ultralight Three-Person Tent provides a compact, lightweight and unbelievably rugged shelter for the serious backpacker. 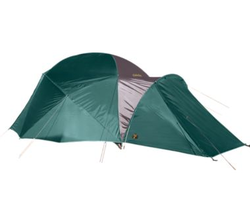 20-denier nylon taffeta fly with an 1,800mm-rated polyurethane/silicon coating keeps you dry in rain and snow, while the No-See-Um mesh tent has an incredible 30-denier, 2,000mm-rated polyurethane/silicon coated bathtub-style floor that provides a worry-free barrier against water and rough ground. 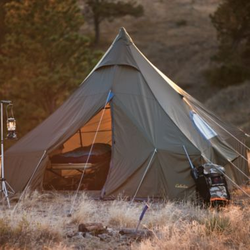 Top all that off with DAC's revolutionary NFL poles and J-stakes, and you've got a durable, minimalistic tent that won't let you down. This tent is also loaded with features that help you sleep soundly. High and low vents increase air circulation, overhead gear storage maximizes sleeping room and the included 75-denier waterproof footprint protects against abrasion and wet ground. YKK® zippers with reflective pull tabs deliver flawless performance in adverse weather, while reflective guy lines are easy to see in low light. Tent and footprint packs up into a unique stuff sack for convenient transportation. Imported. Quite possibly the simplest design among quality tents today. Camping with the Outback Lodge ends the hassle of fighting with cumbersome pole sets. Setting up this 6-person Outback Lodge tent is as simple as (1) staking out the corners, (2) raising the single center pole and four internal corner poles, then (3) securing the guy lines. That's it; camp is made. You can even leave the center pole at home and simply hang the center peak of the tent from a limb for a lightweight spike camp. Walls are constructed of 190T nylon taffeta treated with a 1,500mm polyurethane waterproof-rated coating. The long-wearing floor is constructed of 210-denier oxford nylon. Double-pull zip-close door with zippered No-See-Um mesh panel. Three No-See-Um mesh windows, two new mesh-screen vents near the top and newly redesigned ventilation panels on the sidewalls reduce condensation. Plenty of headroom adds an extra measure of comfort. Stakes and stuff bag included. Optional floor liner for easy cleanup and extended floor life. Imported. Floor dimensions: 10' x 10'. $19 a day, 10 day minimum. Field tested in Alaska, where the winds alone can fold a lesser tent, our Alaskan Guide 6-person Model Modified Geodesic Tent has proven it can take the extremes nature dishes out. The large geodesic is the result of state-of-the-art tent design, manufacturing and fabrics and is now better than ever with a newly designed integrated vestibule and a full-coverage fly. Its good shape combined with our unique six-pole system offers incredible stability. Its rugged construction boasts 100% ripstop nylon, except for the floor, which is made of an abrasion-resistant oxford nylon. The full-coverage 100% polyester fly is UV-resistant for extended life, and has a 2,000mm-rated polyurethane coating to shed pelting rain and wind-swept snow, while the floor boasts an extra-thick 3,000mm-rated coating to block moisture from below. The vestibule adds storage space for your gear and protection from the elements, making the Alaskan Guide a true four-season tent. The door uses a "D" design that presents less exposure to rain and moisture, while permitting easy entry and exit. Additional "D" design windows and three roof vents create added ventilation. The door and vents have No-See-Um mesh screening that keeps out even the smallest pests. Smooth-operating No. 8 and No. 10 YKK® zippers throughout. Three mesh organizer panels and a gear loft located on the inside walls keep floor space clear of gear and offer a place for stored items to dry. Four conveniently located interior cup holders keep drinks from spilling. Guy-out loops are reinforced and included. Heavy-duty shock-corded fiberglass poles for quick hassle-free setup. Recommended for extreme weather conditions. Weight listed include stakes and guy rope. Imported.